Why not have a photo slideshow of family photos or company pictures viewed on a flat screen TV? We can gather all of your pictures and even some videos clips, to create a slideshow, complete with music, for your guests to view during cocktail hour and for the remainder of the reception. 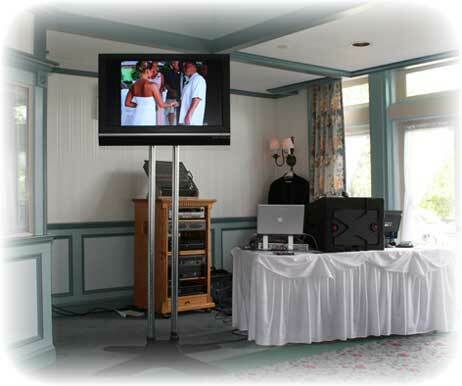 We’ll play it on a flat screen TV and loop the slideshow so that guests can enjoy all of your favorite memories! We can also provide a large screen if you want to view the show in the reception hall. Best of all, you get to bring the DVD slideshow home to cherish forever! Don’t trust this important part of your reception to a relative or friend. Let us handle it professionally to make this a memorable part of your special day.